harry brandenburg - Naval Air Station Fort Lauderdale Museum Naval Air Station Fort Lauderdale, the only military Museum in Broward County, on the register of historic places. ​This led me on a long overdue quest to find more information relating to my father's Navy experiences. I was able to contact Paul Stillwell, and I told him what I had found and he graciously arranged an introduction to a Navy historian who provided me with data on the Arizona's Desk Log confirming the fact that my father was in the photograph. Mr. Stillwell also arranged with the Navy to have the original photo plates reproduced and to send me copies of the book's 8” by 12” photograph. ​Well, the story doesn't end just yet. A Navy archives technician was able to locate and send me copies of many old documents including my father's records, watch reports, and orders to report for duty. There was even a record of two demerits he received because he left his dorm room windows open. Also included in the package was a copy of the wartime graduation group photo (including my father) of the First Company Engineers. After the war he became a Mining Engineer, and then businessman in New York. Harry's son, RON BRANDENBURG Served in the US Navy from 1953 - 55 as a Radioman aboard the Destroyer USS Isherwood DD-520, and then the cruiser Baltimore CA-68. Ten years ago I was wandering through a bookstore and came across a very large history book titled “Battleship Arizona” by Paul Stillwell. I was interested in books relating to warships, having served in the Navy in the early 1950's as a radioman on both a cruiser and a destroyer. 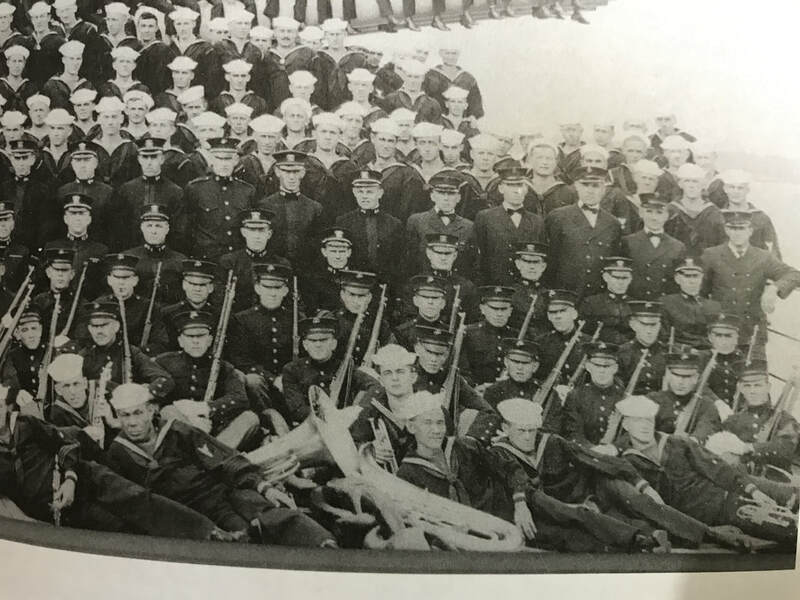 While browsing through the book, I stopped on pages 34 and 35 and saw a fabulous two page photograph dated 1918 showing the Arizona's wartime crew posing on the ships forecastle. Can you imagine my surprise and feelings when I recognized my father's face among the 4th line of officers? I was amazed that this history book located in an obscure corner of a book store contained a photo of my father taken over 90 years ago. 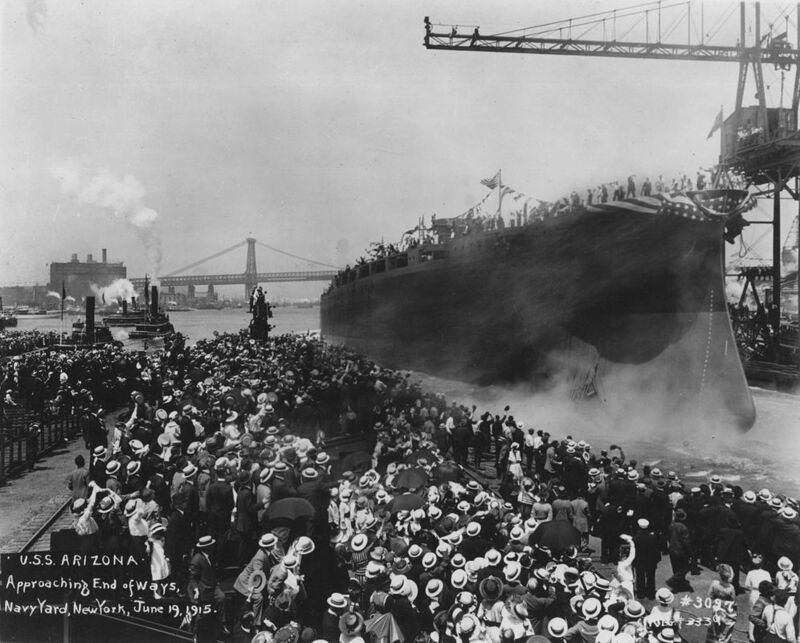 Arizona at the New York City naval review, leading ten dreadnoughts that paraded past Secretary of the Navy Josephus Daniels, December 26, 1918.